Total Revenue from operations stood at Rs 1411 crores for the quarter ended Dec 31 2016. This is an increase of 6%. 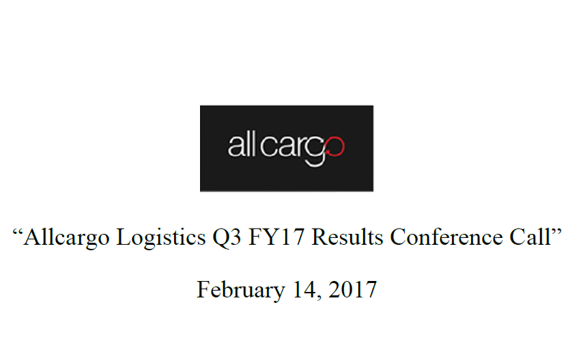 Q3 saw a slowdown in logistics & shipping business, as there were no new projects that really took off ground. In Q3 the company sold ship which was more than 25 years of its effective life & one ship was under repair. PAT was 49 crores a decline of 10%. This was mainly because of deferred tax impact on account of IndAS guidelines. Net Worth as on Dec 31 2016 stood at 1894 crores. Consolidated Return on capital is at 14%. The company has not able to find out why MTU realization are dropping. The company believes that this phenomenon is temporary & as freight rates start kicking back the company will reap the benefits of the freight rates. Earlier, all the expenses incurred till the facility commenced operation was capitalized, but as per the new accounting standards and in line with the generally accepted accounting principles, the lease rental paid to the Kolkata port has been debited to the revenue expenses and not capitalized, and for the 9 months ended December 2016 the amount is close to 3.5 Crores, and that has been accounted in this quarter as expenses. Decline in EBIT is of 8 crores out of which 3.5 crores is on account of rentals to Kolkata port & 4.5 crores on account of expenses for Mundra CFS. Kolkata has approximately 4 CFS & all of them are small size. The Port volumes have been increasing by approximately around 20% in last 2 years. The port activity has been improved because BSA has taken over the operations and maintenance of the port at Kolkata, so the company expects that the volumes should continue to rise. This would increase approximately 65-70% of company capacity. Indian logistics market size is around 130 billion and is expected to grow by 300 billion by 2020. The government has focused on infrastructure development in the budget & with GST implementation it is a positive step. The government has taken decision to improve ease of doing business & came out with new customs regulations in which the ports have been asked to give deliveries directly from the terminals instead of putting it into the CFS. But what the company has seen in recently is that most of the cases the volumes have not been able to be delivered at the terminal because the process with which the trade works is different. The trade requires in many cases that call should be made of credit terms, the original bill of lading, the clearing process, the factories or the trading houses to have their own storage facilities, these issues have come up from the customer end. Right now the volumes are only 5% but the company says it will have to wait & see how industry adapts to this new policy. Cost for dry docking of ship - around 4 crores. For Kolkata till date the expenses incurred are 31 crores & thereafter other maintenance Capex are pertaining. The company is world leader with a global network covering over 80% of the world. The company operates out of 300 offices in 164 countries. The company started with CFS & ICD operation & CFS expansion is well on track. DRFC on the western corridor is expected to be ready by 2020, so the Jhajjar project is in line & it is dependent of course in the future on the DRFC. The company has started managing operations of facility at Mundra & this is an asset light model. The company has leased out 40 acres & expecting numbers to be ramped over the coming months. This facility at Mundra will not only add to the volume numbers but will also help in the P&L. In Q3 volumes grew by 14% Year on Year to 75787 TEU’s & this is from all the 5 facilities including new Mundra facility. 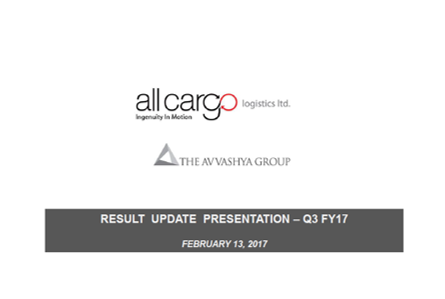 The revenue for the quarter grew by 1% to 111 Crores and the EBIT for the quarter was at 32 Crores, a decrease of 17%. This was mainly on account of lower dwell times which was seen CFS business, rentals booked for the upcoming CFS at Kolkata as per the new IndAS guidelinesand the expenses of managing the CFS at Mundra in Q3. The return on capital employed was 32%. The company's equipment leasing business continues to do well, in the shipping business the company sold one ship that was around 25 years old & may sell one more. One of other ship is under repair & maintenance last quarter due to engine failure. This ship was out of business for last 2 months & expect this vessel back in sailing shortly.